Friday Realty is very proud to be a part of Think Local First Santa Cruz. 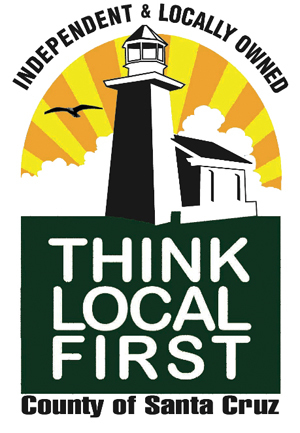 Think Local First is a network of independent and locally owned businesses and community organizations that have joined together to promote economic vitality and preserve the unique character of our community. Locally owned businesses spend their profits locally, purchase more goods from local suppliers, and employ their own office and support staff. When more money gets re-circulated in the community, general prosperity as well as tax revenues increase, creating a more vibrant and sustainable economy. Locally owned businesses tend to stick around when times get harder. A local owner doesn’t easily pack up and leave town for “better” pastures. Because they focus primarily on local markets, locally owned businesses tend to be smaller and place a high premium on being easily accessible by local residents. Business owners, who live in town, take better care of the environment; participate in public life and local charities. A wide variety of locally owned businesses contributes to a stronger local identity and cultural diversity, creating an attractive place to live and visit. Chances are, when you buy from a locally owned business, part of your purchase will benefit your neighbors and friends.